In 1942, almost $4,000 was devoted to "reconditioning" the Chapel. Walls were repaired, pews varnished, candlesticks refinished, kneelers reupholstered, and new flags installed. At the same time, Mr. and Mrs. Frank Nolan of South Orange expressed their interest in contributing to the continuing care of the Chapel. Mr. and Mrs. Nolan personally oversaw numerous contracts for the refurbishing of the Chapel. Less than ten years after Professor Raggi restored the original mural painting of the Immaculate Conception and added the adoring angels, it was necessary to "resecure the canvas back to the wall...thoroughly clean the entire surface; recolor...the background...(and)...reglaze the entire surface." Balcom Preis of "Iron Forge Decorators" of East Orange so informed Mrs. Nolan in 1943, estimating the cost at $200. It is not clear that this work was undertaken. In 1946, the Nolans engaged William Doig and Sons of New York to oversee and conduct a major renovation of the Chapel. 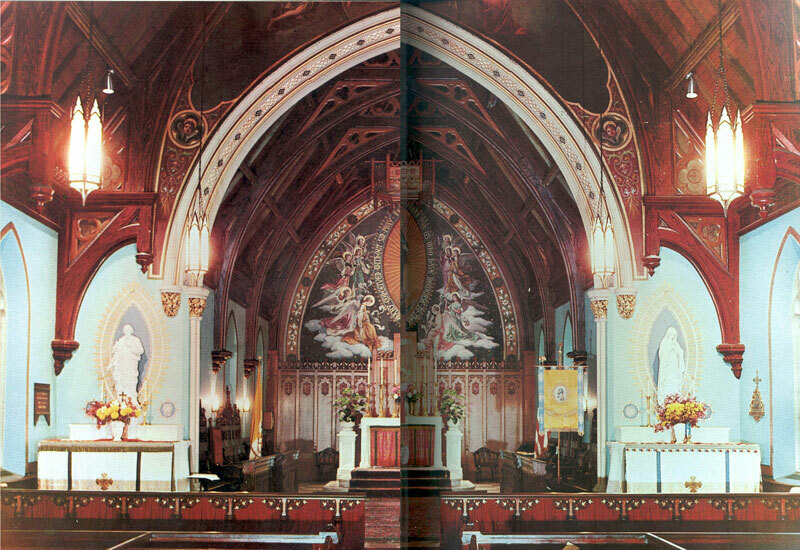 This included new carved oak paneling with a central cresting in the form of reredos for the rear wall, an oak baldachin, or canopy, also called a tester, and major changes to the main altar. The cost was about $3,500. Interestingly, all negotiations were carried out between the Nolans and the contractors, and the Nolans directly paid the contactor. Professor Lelio de Ranieri was the artistic supervisor for the project. In addition to the major changes, radiant mandorlas were painted behind the side altar statues of the Blessed Virgin and St. Joseph, and the arch and rear wall were cleaned and "enlivened." The work began in 1947 and continued into 1948. After it was completed, Mr. Nolan ordered work done to enhance the lighting and replaced the mensas (tops) of the side altars. 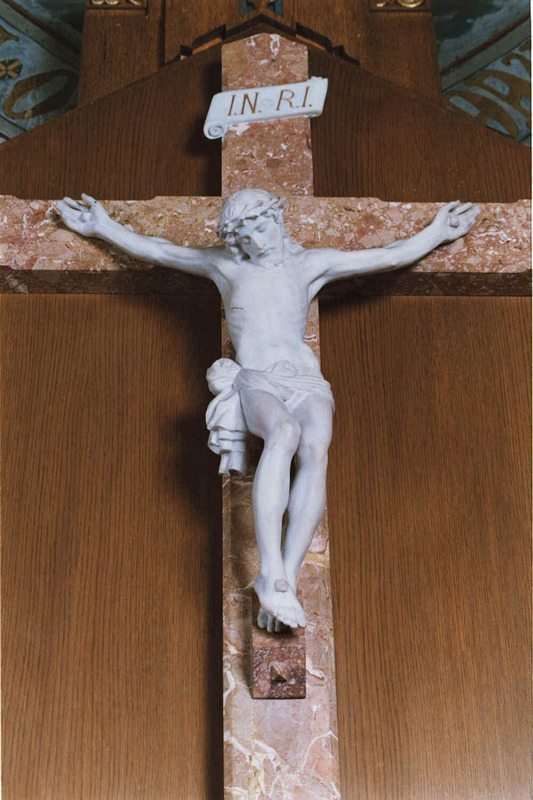 In 1949, he would add an Italian marble crucifix at a cost of $500. This endpaper photograph from the 1955 yearbook shows us the Chapel as it appeared after these renovations. The Nolan renovation may be summarized. The gradines on the main altar were replaced with lower gradines made of orange marble, and a new free-standing bronze tabernacle was installed. 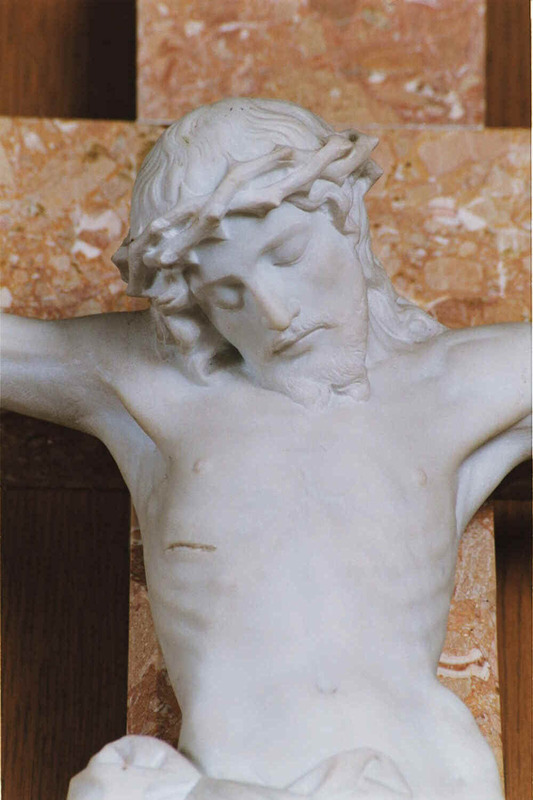 A cross, also of orange marble, with a white marble corpus was placed over the tabernacle. 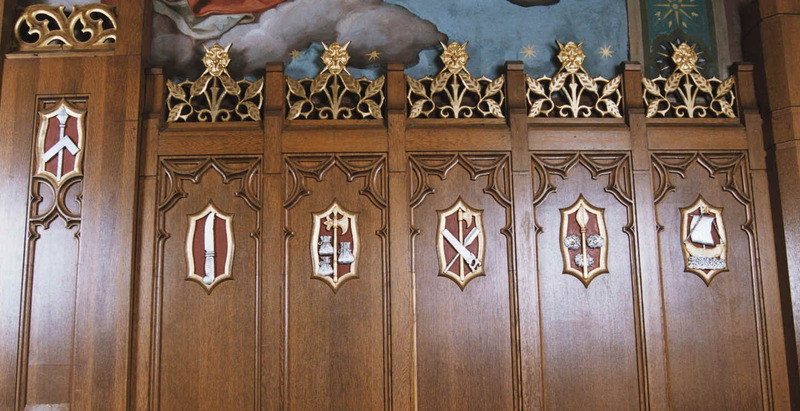 The rear wall beneath the mural was enhanced by wood paneling decorated with symbols of the Twelve Apostles. A baldachin, or canopy, was hung above the altar, close to the ceiling. Mandorlas, radiating flames, were painted behind the statues of the Blessed Virgin and St. Joseph. The arch, corbels, and capitals were decorated with stenciling and gold leaf. Finally, the plaque dedicated to the benefactors of the Chapel was placed on the wall beside the Blessed Virgin's altar. In addition, the lighting was enhanced. Unfortunately the baldachin is placed so high that it is hidden by the chancel arch. This is probably unavoidable since to place it lower would obscure the chancel wall mural of the Immaculate Conception. 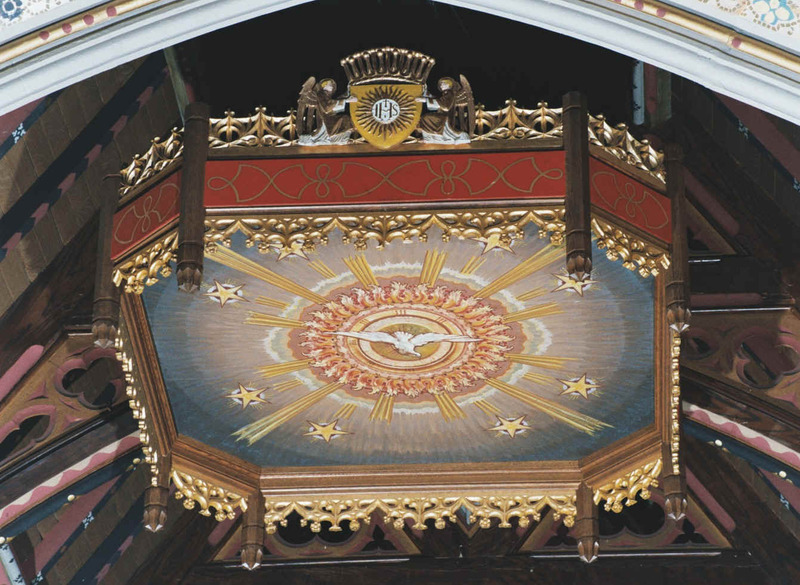 The red-bordered baldachin, embellished with gilt gothic tracery, features a painting of the Holy Spirit as a dove hovering over the altar. 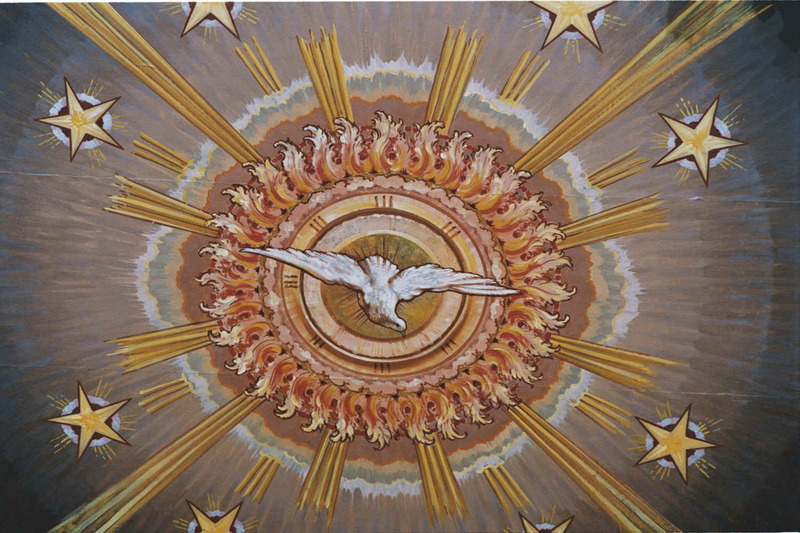 Flames radiate from the dove, exploding into clouds and rays of light on a star-studded blue sky. 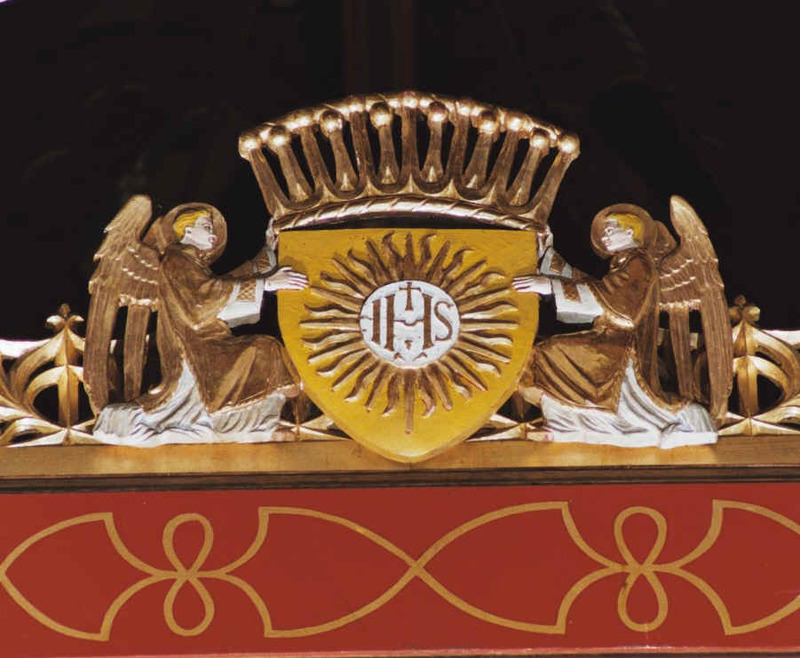 On the front of the baldachin, angels kneel in worship before a shield symbolizing the Eucharistic Host signed with the Greek letters "IHS," the first three letters of "Jesus" in Greek. The shield is surmounted by a crown. The chancel wall oak paneling is a contemporary version of gothic with elements of Art Deco. This style is common in churches of the second quarter of the twentieth century. On each panel is a shield with a symbol of one of the twelve Apostles. There is a variety of symbols associated with each of the individual Apostles. The order of precedence of the Apostles also varies. In all cases, St. Peter is given first place. "Gift of Gertrude and Frank Nolan - In Memory of their Beloved Parents - Feast of Corpus Christi 1949"